I have recently learned about an exclusive Swarovski Polar Bear Key Ring produced by our favorite crystal brand. This key ring is like other key rings in that it is 20mm in diameter, features the usual silver chain and closing clasp for your keys. Its packaging is a black velvet-like bag. However, this polar bear key ring was produced to coincide with the production of the Swarovski SCS Siku Polar Bear, the 2011 SCS Swarovski AE. I do not think that we’ll be seeing many of them. Our reliable sources indicate that the Swarovski Polar Bear key ring was available only in Hong Kong. It was a “Gift with Purchase” at a Private Shopping Night. The Swarovski assigned identification number is 1145200. 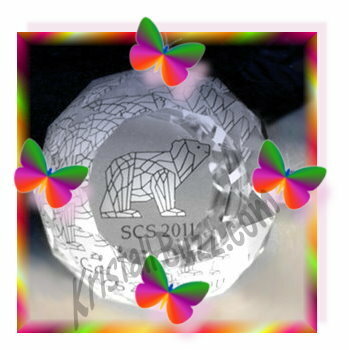 Just as a reminder, the Swarovski Polar Bear Siku is only available to Swarovski SCS members through the end of 2011. And the availability is the same for the Swarovski SCS Polar Bear Cubs, Crystal Moonlight and Swarovski SCS Polar Bear Cubs, White Opal – done at the end of 2011. If you are planning to collect your Swarovski SCS Loyalty Gift, in 2013 be sure and make your purchase online at the Swarovski shoppe or from an authorized Swarovski agent and confirm that they have used YOUR SCS # for the Swarovski Annual Edition redemption.